This wacky and sadistic celebration of one dysfunctional corporate weakling, and his eternal punishment at the hands of his bosses, is entertaining but also equally painful to watch. Meager plotting aside, the episodic structure of the movie is so loose as to be practically severed. Yet the pacing, plus the endless sight gags and hilarious sound design, are some of the comedy's best assets. Highlights include a rainstorm-hindered soccer game, a camp-out, and a ski trip which climaxes with our bumbling hero being unceremoniously dunked into a vat of polenta. 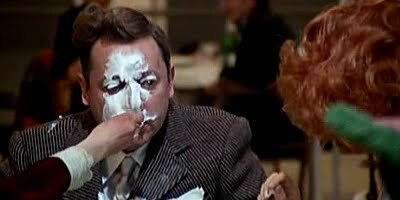 What makes the movie even more rich, though, is the considerable sympathy shown toward Fantozzi's plight, plus one perfectly measured scene of sentimentality that rescues the movie from becoming an all-out childish circus of "boings!" and "splats!" Judd Apatow could learn a lot from this balance of laughs and social commentary. The movie's communistic ending is especially memorable and brilliant, capable of hitting a chord with anybody whose survived a cutthroat work environment and dreadful office politics. Endless sequels followed. The movie's opening fifteen minutes is spectacular in both its visual comedy and energy. Fantozzi's simian daughter is actually played by an unfortunate-looking boy. The star Paulo Villagio, and co-writer of the script, originally wrote the material as columns for a newspaper, then later adapted it for the screen. Decent madcap entertainment, yet not lacking in intelligence.